The mood of uncertainty that prevailed in the UK prior to the referendum deepened considerably once the result was announced and is unlikely to lift while the vacuum that surrounds the UK’s approach to leaving negotiations persists, let alone the EU’s reaction to these negotiations. Nature abhors a vacuum and it can only be hoped that the unexpected acceleration of the announcement of the new Prime Minister produces the first green shoots of stability, in spite of the impending parliamentary recess. Nevertheless, it seems inevitable that in the short term at least, Brexit is likely to have an adverse affect on the vision industry and the full effects won’t become clear for another couple of years or however long it takes to shape the terms of the UK’s future relationships with the EU. The effects are, however, likely to be more marked for vision components suppliers than for systems integrators. Mark Williamson, former UKIVA chairman and director of corporate market development at Stemmer Imaging, presented an analysis of the UK vision market to a meeting of the European Machine Vision Association (EMVA) just a couple of weeks before the referendum took place. The UK vision market has many sectors and non-manufacturing applications are significant. In fact the largest single market sector is broadcast/media/sports/entertainment. This is followed closely by general integrator and machine builders. Other important sectors include infrastructure (traffic, road and rail), medical, scientific imaging, food, print and document handling, automotive, electronics, security and surveillance, defence and aerospace, and many more smaller sectors. How each of these individual sectors is itself affected by Brexit will determine the continued demand for vision systems and ultimately that is the major challenge for the industry. Williamson’s experience was that demand had eased in the six months leading up to the referendum with a corresponding drop in sales as people waited to see the outcome. Critically it will be necessary to see how this demand, or total market size, shapes up in the coming months and years as the UK vision companies face the possibility of chasing a diminished market size. 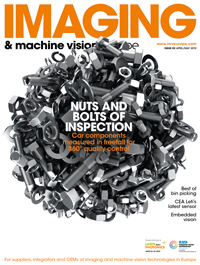 In addition to the market sectors, it is also important to consider where the machine vision revenue comes from and Williamson estimated that around 30 per cent comes from vision component sales with the remaining 70 per cent coming from vision solutions, or integration projects. For the components market, around 61 per cent comes via distribution, 31 per cent via direct sales and just 8 per cent from UK manufactured products. A major issue facing the UK vision market is that there is only a very small manufacturing base with more than 90 per cent of vision components being imported. These come in from all over the world, including the US, Canada, Japan and other Far Eastern countries, as well as Europe. Clearly, then, exchange rates with all the major currencies will affect UK pricing. Although the pound has dropped sharply against the euro, at the time of writing it was trading at levels similar to those of around three years ago, but the pound has taken a much greater hit against the dollar and the yen. Again, at the time of writing, the pound was at a 31-year low against the dollar. A falling pound makes imported goods more expensive, and Williamson observed that Stemmer Imaging held off UK price increases assuming that the UK would remain in the EU and exchange rates would recover, but the further falls since the referendum have meant that the company has increased UK prices by 8 per cent generally and in excess of 10 per cent for Japan-based products. This is likely to have an impact on unit sales which are expected to continue to drop until some stability emerges. Nevertheless, as noted above, around 70 per cent of UK vision revenue comes from vision solutions and integration projects. As Paul Wilson, vice chairman of the UKIVA and managing director of Scorpion Vision, observed, in these cases, the vision components can be a comparatively small proportion of the total project cost and so exchange-rate induced increases in component costs have comparatively little impact. While suppliers providing added value to the vision components, right up to full integrators will be shielded to a certain extent from these rises, there still needs to be the demand for these vision projects, so work needs to be done to make sure that the market understands that costings for integration projects are unlikely to shoot up as a result of Brexit. Of course the UK vision manufacturing sector shouldn’t be forgotten. Most of these companies rely heavily on export business and could benefit in one of two ways from the falling pound. If they sell products priced in pounds, their products will now be cheaper in European and other countries. On the other hand, if they maintain prices in local currencies, the weaker pound will deliver better profits. It is not just about the UK vision market, and clearly the UK leaving the EU will impact the vision market in Europe as well. From a VDMA standpoint – Williamson is a current board member of VDMA Machine Vision – the UK is the most significant European importer of machine vision equipment, so any slowdown in UK component sales, whether fuelled by uncertainty or price rises resulting from the weaker pound will impact other VDMA members. There is a feeling within Europe that by voting to leave, the UK has lost the opportunity to help reform the EU and work towards resolving issues. This is countered by some Brexit voters in the UK who believe that the current EU structure is not only inefficient, but not sustainable in the mid future even if the UK remained and that the UK leaving will merely accelerate this. Nevertheless, whatever opinions individuals may have, the country has taken a decision and what matters now is the shape of the agreement that is negotiated between the UK and the EU and the effect that it has on trade between them. Some have advocated that the UK seeks to become an EEA (European Economic Area) member (or equivalent) like Norway. Wilson sees this as a positive move, having traded regularly with Norway for many years. He observed that trading with Norway as an EU member has been seamless, so would hope that a similar outcome for a UK trading position could work well for future UK trade with the EU. Indeed the Norwegian vision component suppliers he deals with have not expressed any concern about Brexit or future trade with the UK. There are some fears that the final trade agreement that is negotiated will result in additional taxation or duties to be imposed on goods which would not only further increase prices but add to companies’ administrative burden. Many vision component suppliers, however, will already have a supply infrastructure in place for non-EU countries, so while there is an obvious downside in increased prices, they would be able to use their couriers to handle any new paperwork requirements in the same way as they do with non-EU countries. The current volatility in the money markets and stock markets, lack of positive progress at government level and the media frenzy surrounding Brexit have made it impossible to predict where things will eventually end. It is unclear at this stage whether we will see a full scale recession; however, market growth is expected to slow, quite possibly to stagnation inside the UK. Sometimes fear of the unknown is worse than the unknown itself, and a period of calm would be welcome to bring some stability and allow businesses to concentrate on selling their products and services. The Vision show in Stuttgart in November will provide a useful barometer of the vision industry throughout Europe and visitor numbers and interest levels may offer a better insight as to how things are shaping up as a UK exit strategy begins to evolve. Mark Williamson is a former UKIVA chairman, current board member of VDMA Machine Vision, vice chairman of the PPMA and director of corporate market development at Stemmer Imaging. Paul Wilson is vice chairman of the UKIVA and managing director of Scorpion Vision.